Music that unites, that treats tradition with respect and yet still opens exciting doors to the new. With the release of their new album “Oeo” (col legno), ALMA have proven themselves to be a formation that understands how to redefine folk music in a compelling way. It was already apparent on their last release in 2015, Transalpin. But now the quintet that set out to redefine traditional alpine folk music has moved into completely new musical dimensions with their latest album. Not that the winners of the RUTH World Music Award would actually deny their folk roots. They still play an important role. But a lot more has been added to their repertoire since the early days. Julia Lacherstorfer (violin, vocals), Evelyn Mair (violin, vocals, tamburello), Marie-Theres Stickler (diatonic harmonica), Matteo Haitzmann (violin, vocals) und Marlene Lacherstorfer (contrabass, vocals, tamburello) celebrate their very individual form of crossover on “Oeo”. One that goes beyond any stylistic borders and combines a diverse mix of musical genres and epochs. The quintet takes their listeners into a world of perfectly dignified sound. A world in which a 3/4 beat is combined with the melodies of foreign lands into a fascinating whole. The works of ALMA move back and forth, in some works focusing on chamber music influences, in others on folk. Every now and then hints of pop and classical music are obvious. And they combine them with the energy of the waltz or polka, and the elegance of the musette into a fascinating and completely new creation. With “Oeo” ALMA have proven exactly why they are where they are. Why they enjoy the reputation they have, both here and abroad. The new album is one that really gets to the listener, awakens slumbering emotions, celebrations, and melancholy in a beautiful way. It is truly an extraordinary work. Alma’s melodies cannot be attached to specific points on a map; they traverse national limits and musical limitations. They even cross time, as in Matteo’s replaying of whispered conversations, overheard on an afternoon in London’s Regent’s Park at the turn of the last century. In this constant layering of worlds and gestures, the band never prescribes or proscribes, instead tendering the enthralling idea that “home” and the longed-for “somewhere else” can exist concurrently. Even if we’re rendered blind (or deaf) by our daily grind, our soul’s “imaginary sight”, as Shakespeare once called it, can still present shadows to our “sightless view” … and those images have no topography. “Tam Tam” is indicative of this free passage between worlds. During the Raunächte, spanning the Twelve Days of Christmas, numerous rips are said to appear in the fabric that divides our realm and that of the spirits. It is a time when the mythological Wild Hunt of phantasmal souls drives in mad pursuit across the sky, binding transnational folklore together, from Norse to German, from Canadian to Welsh, inspiring Schoenberg’s Gurrelieder and Swedish black metal band Watain in turn. Alma likewise connects with their kindred spirits, such as Federspiel from Krems an der Donau (heard on “Tam Tam” and “Bazzarah”), the Estonian friends with whom Julia and Marlene played in childhood or the wolves who are reincarnated, bone-by-bone, by the “Wolfsfrau”. No, they are not naive, these five young people; native, yes. Original. Authentic. Incidentally, Alma Nativa is also a Chilean beer brand, which may be a good omen in view of the anticipated global success of the band. Alma are casual, but not careless. Cool, but not cold. They are smart, but not intellectual, emotional, but not sentimental, virtuoso musicians, certainly, but without the urge to constantly show off their skill. When they do, they do it with a twinkle in their eye. In their music, tradition, improvisation and innovation are merged into something new, something very much alive. In the interaction between rhythm and melody, between dance and emotion, between urban and rural, between whispering and screaming, the native land becomes defamiliarized, and thus comes alive again. The traditional can become authentic only through reinventing itself. Thanks to Alma, the word “Volksmusik” has finally lost its terror. Alma have conquered the heart of this music. They have certainly conquered mine. Auf der Alm(a) Alma: what does it mean? The soul. It may also make you think of ‚Alm‘, the German word for an alpine pasture or hut. And, of course, of Alma Mahler, and the world of yesterday. 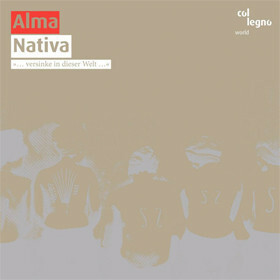 So writes René Freund in his introduction to Nativa, the first album by Alma, a brilliant, original Austrian Volksmusik band. Folk is not my ken, as regular readers well know. Though in writing about Schubert, Brahms, Mahler, and many in between, I have become increasingly familiar with the folk traditions on which my chosen composers drew. Yet they are not traditions that just feed the Classical world, but they continue to thrive, evolve and, ultimately, seize back the music, sometimes with Classical tropes. Certainly Alma – made up of Julia Lacherstorfer, Evelyn Mair, Matteo Haitzmann, Marie-Theres Stickler and Marlene Lacherstorfer – draw on a variety of sources. Their album, which has recently won the German Record Critics‘ Prize, flaunts an extraordinary range, from snatches of Reger’s Abendlied to Bart Howard’s ‚Fly Me to the Moon‘. Such tracks appear alongside yodels written on napkins in pubs in Upper Austria, Bourbon bourrées and Paris in Spring, all delivered with typical Viennese flair. Defying my expectations of ‚folk‘, Nativa really is a wonderful album, a psychogeographic trip through the Austrian countryside, its extensive musical traditions and beyond. There is, of course, a sort of ripe crudeness about some of the numbers, bringing the pungency of the meadows to your speakers, yet the playing is always top-notch, with Bachian poise one minute and jam-like abandon the next. This is truly one of the most original soundworlds I’ve encountered of late.